A lot of things going on this week. Announcers played up Son of Havoc’s poor win/loss record. Ivelisse defended Son of Havoc against the Twitter haters, but the crowd was actualy more behind him than the relatively unkinown Angelico. Ivelisse got on the apron to congratulate Havoc with a kiss during the match, which lead to a lot of near collisions (and a near Angelico kiss) before Havoc and Ivelisse bumped into each other. Ivelisse was sent to the floor, Havoc was sent backwards into Angelico’s cradle for the win. Ivelisse was not happy with the situation or Havoc after the loss. Johnny Mundo and Dario Cueto met in Cueto’s office, with both men offering to put the past in the past. Mundo seemed to really mean what he said, happy to face Cage as a path to the title. Cueto, as usual, was less sincere. He seemed to see Cage as a tool to gain revenge on Mundo and restarted their main event after it was Cuerno attacked Mundo with a chair shot to the knee. Mundo fought for a while but Cage took him out. It seemed like King Cuerno got involved for his own purposes – he declared the Hunt Begins Again while attacking Mundo – but Dario seems to be behind a lot of things. Cage is in possession of the remains of the Lucha Underground belt, carrying it around as if he is the true champion. Another Pentagon Jr. vignette aired, with Pentagon speaking in Spanish about his lack of fear. He broke Famous B’s arm with his submission hold, then Pentagon told his mentor that Pentagon was ready for him. It’s not clear who the mentor is – or really even if Pentagon actually has a mentor. Aerostar & Drago both wrestled as tecnicos and shook hands after the match. Fenix, training backstage, was visited by Catrina. She flirted with him and seemed to be setting him up for the Lick of Death, but instead kissed Fenix and told him not tell Mil Muertes. It’s unclear what Fenix thought of all of this. Dario also revealed he did know “matanaza” and it was related to his mystery monster. Dario mentioned the mystery lady is named Black Lotus and whatever happened occurred when she was a young girl. Dario suggested letting her find the mystery guy (and let him take care of it), but said he had to protect the temple from matanza. The Mystery Area must be relatively close to the Temple, or inside it somewhere, because Cuetro was able to get from his office to his mystery man and back over the course of the house. The show visually looked pretty similar to the one the previous week. The only way you would’ve seen it was the start of a new batch of tapings would’ve been by all the stories which just got kickstarted. There were also more direct statements on those storylines: Catrina explicitly pointing out the life/death symbolish in Fenix and Mil Muertes, Striker & Vampiro talking about Aerostar & Drago being a great rivalry even before they both go to the ring, Cage more loudly pointed out as the anti-luchador member of the roster. There was a lot going on here but they made what was going on very obvious. Making it very obvious makes it easy to follow. Both the Dario’s Monster and the Mystery Lady plotlines got some needed momentum by being linked up. So glad Black Lotus got a name, makes life so much easier. I’d now be surprised if we got all the answers about the situation before the end of this season, but it does now feel like they’re heading somewhere with both. The Alberto teaser was perfectly done. Lucha Underground’s really created a neat trademark with those less than minute scenes to end the shows. Everyone’s always looking forward to that last little kicker, and this one was their best. They got the surprise points for Alberto this week, and they can spend the next seven days hyping his actual debut, best of both worlds. Pentagon Jr. is the best possible LA Park. There were matches on this show too! Mundo/Cage was the closest to great, but everyone thing was good or effective for what it needed to be (Pentagon/Famous B.) Aerostar/Drago was the one I wish lasted longer, but they made it clear we’re getting more of them to come. (Plus, Aerostar seemed a little shock up in this one so maybe it’s good it ended when they did.) Angelico & Havoc got more time than I was expected, and Havoc looked good enough in the match that he’s more a guy who doesn’t win and not just a jobber, if that makes any sense. 6) El Patrón Alberto, Fénix, Myzteziz vs Brian Cage, Hijo del Fantasma, Pentagón Jr.
El Patron makes his first appearance of the year on AAA TV and he’s not alone. It seemed inevitable a US wrestler from Lucha Underground would end up showing here, but I would’ve guessed Prince Puma. I guess Cage needs less of an explanation. This is actually not Brian Cage’s first appearance in Mexico; he worked for Todo x el Todo in 2013 as a La Migra member. AAA’s slightly different. Alberto & Cage seem matched up here, since Fenix/Fantasma and Myzteziz/Pentagon are the other rivalries. Let’s discount Murder Clown because he’s Murder Clown (and he may have Electroshock/Pirata issues and even Hell Brothers issues.) Bengala seems to be headed to a tag title match so he’s probably not making the final. That leaves Texano and Machine Rocker and that sure looks like a Texano win – except maybe Texano’s in this big tag match main event which hasn’t even been hinted on TV but looks implied by the way things have been booked? 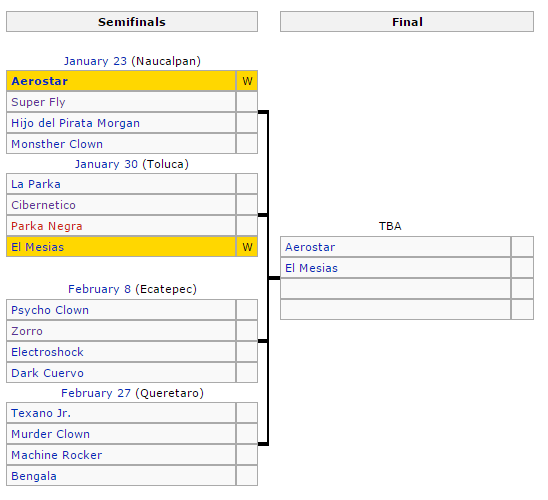 Machine Rocker in the final as a rudo to work with Aerostar makes some level of sense. At the same time, there’s probably reasons why Machine Rocker hasn’t been on TV since September (!) and those reasons probably weren’t “we’re going to have him make a surprise run in Rey de Reyes next year!” Plus, this is kind of assuming Zorro’s winning the next block – if Psycho Clown does, than Texano seems almost certain to face his old rival. All I’m saying is there’s a chance, Machine Rocker fans. And at least he is back on TV. Parka versus Cibernetico continues in the semimain. Angelico & Jack Evans were attacked by the rudos in Toluca so get a chance for revenge here. The other 2v2 match is even more random, with four guys who haven’t had much meaningful interaction with each other. It should be good and maybe something will start up with Daga since he’s been pretty frequently on TV this month. There’s an AULL undercarder named Pegasus (well, sometimes – his name has been spelled 4 different ways.) The Arena Lopez Mateos trainees are anonymous for a big arena that’s so close to Mexico City, usually getting bumped off the card when there’s a major show that’s actually taped. They’ve got a better shot of turning up on IWRG TV for a school vs school cibernetico than anyone taking a handheld of their shows. That Pegasus has been wrestling around the DF area since 2012 and I have no links to videos with him it. The name and position fits with him, though I can’t be sure. There must’ve been one very exciting tryout session recently for all these random names to start filtering in the opening matches. The last week of this taping will air one day before Rey de Reyes. AAA could go right into that show if they’d like. This weekend’s AAA TV will probably make that clear – if there’s no more tapings announced, that’s the plan. Still, this tournament is also far enough away from the show that AAA might be able to hold off announcing the full Rey de Reyes card until after it takes place. Pegasso replaced Rey Cometa on Thursday. Hombre sin Nombre is now known as Luciferno and pulled Triton’s mask for the DQ. Tecnicos took 2/3. Dragon Rojo took the first fall, but lost his head and unmasked Niebla Roja to lose the second. Dragon Rojo won the match with a super powerbomb. Dragon Rojo’s 10th defense. CMLL posted a months ago that Hombre Sin Nombre (Hooligan) was going to be known as Lucifer, than deleted it and pretended it for months before giving him a slightly different name. My uninformed guess is there were issues with rights to the names – trademarking is obviously important to them of late, but maybe more a commission thing – and maybe they tried to resolve it for a few months before giving up and trying to the slightly different name. It probably makes no difference in the long term, but the boring outfit was not helping Hombre Sin Nombre’s boring stint under that name. The mask and costuming is an improvement. Also, if he’s going to use the Hooligan/Luciferno Clash as a finish, then everyone should stop pretending he’s not actually Hooligan and just let him do all of his Hooligan spots. Anyone who would recognize the wacky handspring as something Hooligan did have already figured this out. Cage has been saying “I’m a machine” so often that he might have just changed his name to make it easier for everyone to get the idea. This taping also included a Drago vs Aerostar match as well. Also, Lucha Underground is teasing a special guest surprise on this show. El Patron Alberto’s first appearance was at this taping. His in-ring was in the hour that’s airing next week, but it’s likely a vignette was taped for him which will air tonight. Chavo Guerrero Jr. called Lucha Underground the best wrestling show in the US. CMLL surprisingly posted the Stuka Jr. vs Hechicero lightning match from Sunday (which replaces the usual Tuesday lightning match.) There’s also the stellar moments from a couple weeks ago and highlights from Friday’s show. Maximo is appropriately #1 on CMLL’s top 10 of the week. Titan is #10. AAA posted this week’s TV show in full, including the opener from Naucalpan which didn’t air on Televisa. One of the vignettes airing on the show was Cibernetico confronting Konnan over what happened at Guerra de Titanes. There’s also a text interview with Cibernetico which covers the same ground: Cibernetico says he was attacked by a mystery man which prevented him from making it to the trios title match at Guerra de Titanes. Cibernetico initially blamed Konnan for the attack until Konnan assured him he had nothing to do it. Cibernetico says the Hell Brothers have not joined La Sociedad because he doesn’t trust Konnan but they share common opponents (AAA tecnicos) at the moment. The text interview notes Cibernetico doesn’t is confusing here. Dorian Roldan said the location for Rey de Reyes will be announced on Saturday. That sounds like something was recorded for AAA TV this weekend. The show has been rumored to be in Monterrey, as in previous years. Former AAA luchador Decnnis had emergency surgery for clot in his head (brain?) and a torn lung. The article does not mention what happened, but he’s had complications from surgery and a lot of expenses related to them. A benefit show is being held this weekend. Black Terry Jr. has highlights of Aeroboy, Violento Jack, Mike Segura vs Black Terry, Flamita and Neza Kid from Sunday’s Arena Neza show. +LuchaTV has a ton of new videos, including Jason Gory hyping his Chilanga Mask match and highlights of The Panther & Dragon Lee vs Aero Boy & Flamita with Aero Boy, Flamita and the CMLL guys all talking about the match. Also, Leyendas Inmoratales appears to be setting up a Mr. Jack vs Shu el Guerrero match. Sin Cara Gym will be having a free show on Saturday at noon. It’s their second anniversary show. Last year’s show was the return to Mexico for Myzteziz, which had CMLL’s Sombra making a surprise appearance in a match with AAA wrestlers. There’s no card announced this year. SuperLuchas looks back at Dr. Wagner vs Canek for the UWA Heavyweight title from ten years ago, a match Canek is still planning to avenge. Zumbi introduced his new tall Brazilian tag team partner, Xandao, at a press conference. No matches were announced. Segunda Caida watches the first Invasors match in CMLL, is quickly disappointed. Preview of the four way on ChilangaMask anniversary show. Luciferno pulling Triton’s mask actually goes somewhere. Main event is a random assortment of people. Dragon Rojo and Polvora may remember they have issues. First ever Valiente/Felino singles match. Tercera could be very good. Virus has been lightweight champion for so long that Stuka was actually eligible for a title match at one point. CMLL on Terra: 2014-12-21 – the Maya/Zavala trio was around good. This was also the first part of AAA’s year in review. I actually did write a recap but it doesn’t need a post.